It’s been awhile since I posted. The title of this post should give you a hint about what I’ve been up to since my last post in the Fall. 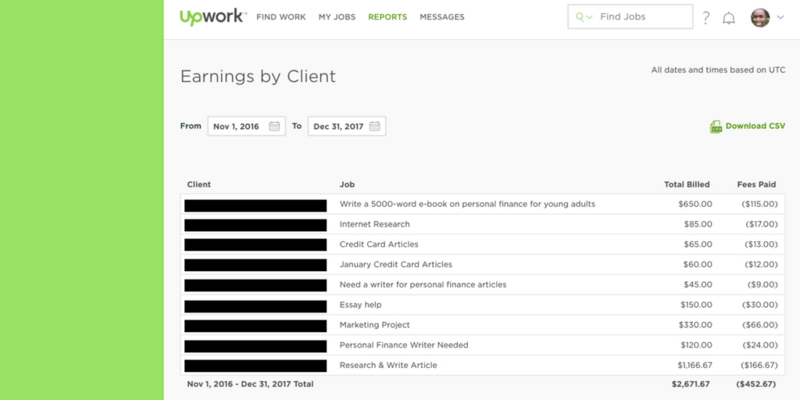 Before we dive in, for those of you who are unfamiliar with Upwork, it is a freelancer platform. They have all kinds of job categories like writing, graphic design, video editing, accounting, and more. Everything happens on the platform: communication with clients through their messaging platform, payment and applying to job postings. Before this adventure, I heard about it on the internet here and there, but I didn’t really understand the purpose of the site. So this was quite the learning curve. Since starting this blog, I have always had an interest in freelance writing but I never really considered it as a possible source of income. 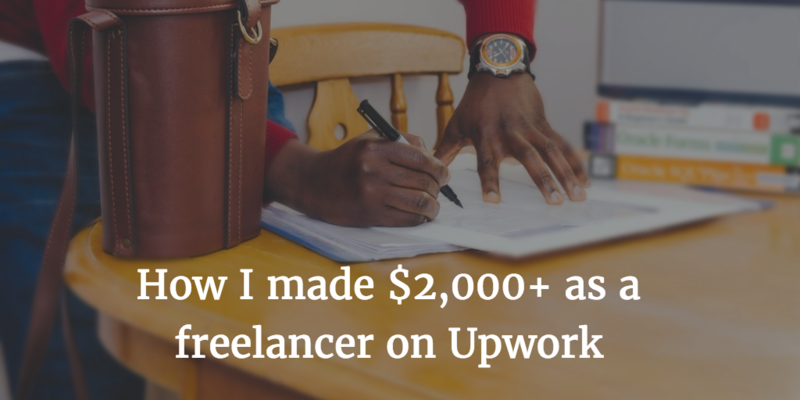 Once I discovered it and understood that Upwork is a freelancing marketplace, I thought I would give it a try. I have never had any professional writing experience aside from this blog, and that was the point. I wanted to see if it’s truly possible to start something from scratch with little to no experience and earn some side income. I’m living proof that it is most definitely possible! Let’s talk about what I learned. In total between the first gig in November 2016 and this posting date, I have earned $2, 215. Not bad! 1-3: The very first project was four 600 word articles for a total of $60. The topic was about credit cards, so it was a pretty fun and simple introduction to this new world of freelance writing, weeee! I ended up doing this same thing for that client two more times. It was cool to have my first recurring client! 5. I found a posting for a research article to compile a bunch of data. I thought the project was interesting so I created a proposal and sent it off. To challenge myself to work on raising my rates, I requested $1,000 as my net price (after the Upwork fee). To my surprise, it was accepted! I really didn’t plan on getting selected for the project, but now that I had it, it was time deliver. I struggled a bit with this one for reasons that I will explain in another blog post, but it was a really good experience overall. The most important thing I learned was that it’s crucial to do a thorough scope of work before taking on projects or suffering will ensue. Lol oh well. 6. One guy wanted my help with some market analysis work he was doing for a personal project totaling $480. This one was not very exciting for me, but I’m glad that I gave it a try. But I learned that I can still do good work on projects that don’t necessarily inspire me. Plus this client was super chill and nice; I really enjoyed working for him. 8. I did one hourly project, which was interesting. This one was also internet research. It requires that you download the Upwork desktop application so that it can track the hours you work on a specific project. The app worked just fine for me; it was kind of weird to have it taking screenshots of my desktop every few minutes and saving them to the cloud in the work diary. I spent 2.5 hours on that particular project for a total of $85 (before fees). Low barrier to entry: #confession-I definitely could have tried much harder with making my profile shiny and fabulous than I did. But again, I didn’t have much going on at the time, so I took the chance to see what would come of starting from the very bottom. So even if you just have yourself and no experience, you can do it too! Easy to find jobs: There are SO many jobs posted per hour! I can only speak for the writing jobs, but there are plenty of opportunities. Low Pressure: Since the pay is often low, it makes for a very good environment for learning (This is just my opinion). I like that I was able to start from scratch and work my way up to more demanding and higher pay work. I wasn’t in a position to be worried that I could deliver because I had already done it successfully before and had great reviews from my clients. It’s a fun way to test the waters for new services you’d like to provide. Fees: That 20% fee can hurt a bit at times. Because if you look at the screenshot below of my billing summary, you’ll see that I earned a few hundred dollars more. But I totally get it, Upwork has to make money too! After a certain dollar amount with each client, the fees reduce, so that’s cool at least. Low-pay: I don’t think this is the best method if you’re trying to get rich off of freelancing. One of the biggest complaints I have heard about Upwork is the ridiculously low pay. I have seen offers for as little as $1 per 1,000 words. At some point, it’s not a good use of time for the payoff, so it’s definitely something to watch out for. I feel like I found some great clients! The platform is sometimes buggy: The messenger has played me several times and sometimes I don’t get notifications that I need to get. One weird thing I experienced was waiting for a client call with the tab open, but I never got a notification that he was calling. That was awkward…haha But, such is life. It takes awhile to get payment: Before you can receive payment from Upwork, you have to have at least $100 (after fees) in earnings available before you can cash out. Then it takes a few days for the transfer to hit your account. It’s not a big deal if you’re not in desperate need of the money. So I wouldn’t recommend this necessarily as a super quick way to get some extra money in your pocket. Here’s a screenshot of my Upwork earnings. As you can see, a total of $452.67 was deducted from my earnings. That equates to 16.9% of my total income. Remember, Upwork generally takes 20% off the top, but after you earn a certain dollar amount with one client they reduce the fees. I’m not sure how it compares to other platforms, though. That could be standard. Overall, this was a great learning experience! My favorite things about this whole experiment were the opportunities and the connections I made. I met some really nice people! I think if you’re interested in freelancing but not sure about it, Upwork could be a good place to start. Since you don’t have to build a brand, create service packages and client contracts, set up your own invoicing software, etc. You can just stick your toes in and start swimming. If you decide that you enjoy freelance work in your respective niche and you get good feedback from your clients, then you’ll know whether you want to go off on your own. Though there are many people who make their living exclusively off of Upwork, at some point I see myself moving off of the platform and adding it as one of my own services. The weirdest one by far was the job that I never intended to get. The most important thing to know about applying to Upwork jobs is that you’re pitching yourself AND the rate you charge. It was a strange experience, as I’ve never been in that situation before. Normally when I apply for a job I’m aware of the rate, so this was new. But I’ll write more about that another time. I’d love to hear what you’re thinking. Do you have an Upwork experience to share or have questions that I can answer for you? Go ahead and leave a comment down below!